As we get back from playing some outdoor fun and games, the NHL starts to get just a bit more exciting as college and pro football begin to wane from our consciousness. Now that we are getting ever closer to the halfway point of the season, it is time to knock off another team from the rankings. After causing so much damage to the Western Conference, it is time to finally eliminate a second team from the East. Picking one was quite a challenge, however. We are getting to a point in the NHL standings where the team eliminated is on pace for almost one point every game. Considering that so many games are left to be played, this sacrificial team could still get in a hot streak and be able to make the playoffs. It has happened before in the Nerdy 30’s history, especially when you take into account that the trade deadline is still a couple months away. Still, the fact that I have to put a disclaimer on the fifth team eliminated this season, plus the fact that Winnipeg, Vancouver, and the New York Islanders have not been as bad as people think shows how much parity exists within the NHL and how massive the middle class has been. Still, somebody has got to go in the latest edition of the Nerdy 30. This might be blasphemous on the surface, but we really need to eliminate Detroit right now. As I mentioned last week, the Red Wings are a franchise that is in need of an en-mass rebuild. However, Jeff Blashill has done some peculiar things that put him in a league with Adam Oates and Patrick Roy as the dumbest of his era. First, Steve Ott was receiving power play time in last Wednesday’s loss against Anaheim. Amazingly, Ott isn’t unfamiliar with playing the man advantage during his NHL career. In fact, the 34-year old played over 736 minutes of 5-on-4 hockey from the 2008-09 season to the 2013-14 campaign. That being said, of the 171 skaters that have played 500 minutes of power play hockey during the same time span, Ott ranked 160th in individual shot attempts per hour and 140th in in points per hour. Add the fact that he’s got only two goals and four points this season and you can see why the uproar makes sense. Still, the Red Wings are a disaster on the power play and Dylan Larkin is the only forward with a league average or better shot attempt rate in that department with almost 28 individual attempts per 60 minutes. No other forward gets close to 20. Gone are the likes of Pavel Datsyuk and Brad Richards while Henrik Zetterberg is just a shell of the player he once was in that unit. Even Thomas Vanek is getting past his prime, so shot attempts are very unlikely to be coming from his direction. 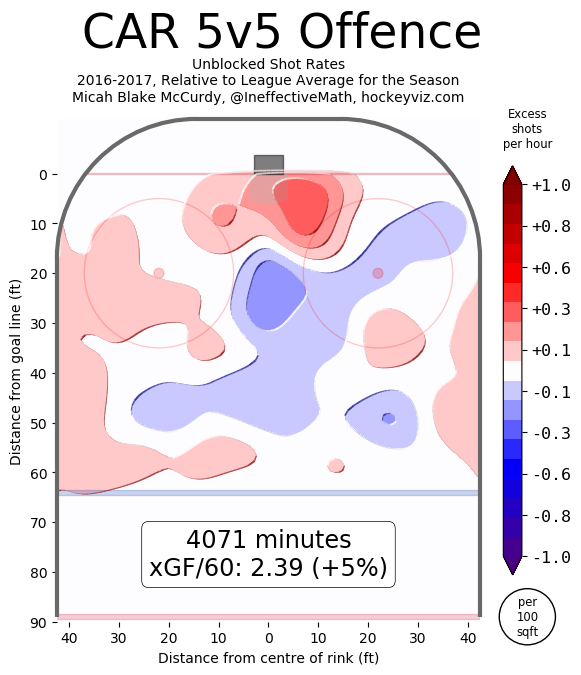 Unless Mike Green can return to full health and unleash bombs from the point like he did a few years ago, this unit should continue to be among the worst in the league. Speaking of Vanek, his presence will always be a hot button issue for any team that employs him, let alone the Detroit Red Wings. Since advanced statistics have been tracked in the 2007-08 season, the Austrian is ranked 185th out of 230 forwards with 5,000 even strength minutes in shot attempts for percentage at 48.3%. However, he also owns an on-ice goal for percentage of 52.7% during that same span: good enough to be 78th. In other words, the man can be capable of delivering you points, but not without massive flaws in other parts to his game. As a result of him being given a sweater every night, Vanek has to be with Detroit’s best non-top line puck possession players to mask his defensive frailties. That almost has him set in stone to play with Frans Nielsen and Gustav Nyquist on the team’s second line. With Anthony Mantha playing with Henrik Zetterberg and Tomas Tatar on the top forward line, that leaves Dylan Larkin, last year’s leading scorer and Detroit’s biggest hope for the future, stuck in no man’s land with Luke Glendening and Riley Sheahan on the third line. While the trio has produced great puck possession, their on-ice shot attempt rate of a little over 47 attempts per hour is terrible for Larkin’s development as an offensive hockey player. Add the fact that Glendening is usually a terrible possession player on his own and you have the recipe for a line that is just not ideal for everyone. Either Andreas Athanasiou has to replace Glendening in the lineup or general manager Ken Holland will have to consider making changes in that department. Either way, these are some of the detailed examples why Detroit is simply not good enough anymore to make the playoffs and how they will need a massive rebuild to get them back to where they once were. After starting off so well in the season, Edmonton seems to be going through a roller coaster season. First, they started the year 9-3-1 and outscoring the opposition 40-32 during that span. Afterwards, they nosedived into a 6-9-4 record despite only having a -3 goal differential between November 8th and December 13th. Since then, the Oilers have gone 5-1-2 and have seemed to get their season back on track. It has been quite clear throughout the season that however Cam Talbot goes, the Oilers go with him. This season, the former Ranger has only posted a 48.6% quality start rate, but has posted a solid 91.9% save percentage in all situations. During Edmonton’s three time periods of focus, Talbot’s save percentages were 92.5%, 90.2% and 93.1% respectively. In fact, he has now saved over 90% of his shots faced in every game he has played since December 6th. With Talbot becoming a dependable and consistent netminder, the Oilers can now translate their better than league average puck possession into a positive goal differential output. There will be two things that they will need to fix if they ever want to make a massive impact in this year’s postseason. The first is that they will need a massive upgrade in their fourth line or defense. Unfortunately, those upgrades are needed to replace Matt Hendricks, Kris Russell, Adam Larsson, Zach Kassian or Mark Letestu. Larsson and Russell have been recent signings and just won’t be replaced immediately, so you can scratch defenseman out of the equation. That leaves us with replacing a trio that contains has a combined $5.1 million cap hit, but have put up 10 goals and 29 points between the three of them. However, Letestu and Hendricks are on the wrong side of 30 and this might be a season too early to see if Drake Caggiula is ready to center a third line into the postseason. If anything, getting a Mike Richards-type of player would be the best thing for the Oilers. That is because the other problem to sort out is their always terrible penalty kill unit. Among all Oiler forwards that have played over 100 minutes in shorthanded situations, not a single one of them have been on the ice for an average of less than 103 shot attempts per hour. That is abysmal and simply will be found out in the postseason. Could going after somebody like a Carl Soderberg (owner of a 94.7 on-ice attempts per hour on the PK), a Derek McKenzie (88.8 attempts per hour) or even a Brad Richardson be a worthy investment for them? All three are more expensive options, but these are pieces that should be able to fit into a puzzle that is not fully complete just yet up front. Honestly, what else can Carolina do to ever make it back to the playoffs? They continue to be one of the better puck possession teams in the league yet always have a miserable PDO to go along with it. This year, only Colorado’s historically bad number is preventing the Hurricanes from being dead last in that category. Almost every year, the go-to reason for the PDO being so low is because of the horrendous goaltending by Cam Ward. He still is a below average goaltender when it comes to his even strength play this season (91.9% save percentage), but his performances on the penalty kill have been out of this world. Of the 30 goaltenders that have played 100 or more shorthanded minutes, Ward is fifth in save percentage at 90.5%. If this season were to end right now, that will be the highest shorthanded save percentage that he has ever recorded in a season since advanced statistics have been recorded. Whether that can be sustainable is another thing since the 2011-12 season is the last season Ward has recorded a quality start percentage as good or better than his current 53.1%. Meanwhile, the Hurricanes have been dead last in on-ice shooting percentage continues to be the worst in the entire league since Bill Peters took the job as head coach in 2014. 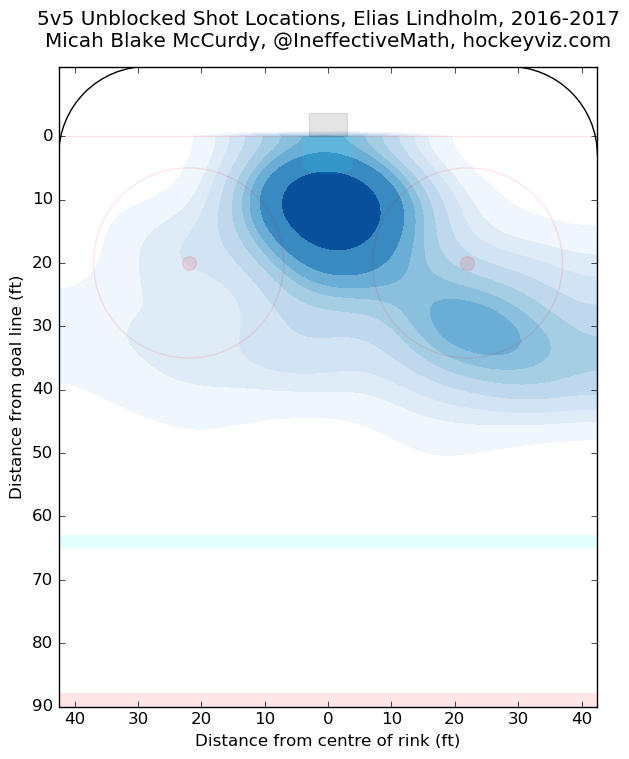 What makes it so strange is that shot location charts have shown that the Hurricanes love to shoot from two specific areas during that time span: the left-handing point and right up along the goal crease. From the days of war-on-ice, it was highly recommended to shoot from so close as that would greatly improve your chances of scoring. However, it could be stated that Carolina just doesn’t shoot from everywhere else, and thus, it makes their offense predictable from a goaltender’s perspective. Take note that there have been only three forwards that have gone on to play 1,000 even strength minutes during the three seasons Peters has been around: Jordan Staal, Jeff Skinner and Elias Lindholm. Of those three, not a single one of them have been considered great point-getters, yet every one of them has a shot chart resembles Mike Knuble’s. Research is still being done about how to develop the most potent offense possible at even strength, but like the power play, you would think that having good spacing among your forward lines would be key to increasing shooting percentages. For now, though, Carolina has to figure out how to get ahead of Philadelphia in the standings in the toughest division in the sport. While everyone will celebrate Columbus’ great achievement of winning 16 games in a row, we also need to celebrate how fantastic Minnesota’s 12 game winning streak was as well. Like their counterparts out East, the Wild’s run of victories now gives them a clear shot at winning the regular season title in the Central Division. Unlike Columbus, Minnesota may not be such a great team based on underlying numbers. While their offense has scored 118 goals in 37 games, corsica.hockey thinks that their shot quality is only good enough for 99.79. That massive difference is thanks to the fact that they’re 21st in unadjusted shot attempts for per hour at even strength. Still, that ranking improves when it comes to even strength shots on goal rate (18th), unblocked shot attempts rate (16th) and scoring chance rate (13th). However, this was a franchise that, for the exception of adding an aging Eric Staal, did not do much to improve it’s offense and is seeing almost everyone improve dramatically in shooting percentage. Consider that Mikko Koivu’s career all-situations shooting percentage is at 9.5%. This year, it is 18.6%!!!! Staal’s shooting percentage has shot up over three percentage points after getting out of Carolina, aka PDO-Hades. Name the top six forward and you will almost guarantee that you will see their shooting percentage improve by the same significant margin. The one thing that can’t be ignored, however, is Minnesota’s suppression of quality opportunities. While Devan Dubnyk has cemented himself into one of the best goaltenders in the NHL since his arrival in the twin cities, the skaters in front of him have continued to go toe-to-toe with his production. This year, the Wild have given up 80 goals against: the second lowest total in the NHL. Along with that, though, their 87.41 expected goals against is not that far off from their actual output. Only Boston rivals them with their 2.08 expected goals against average at even strength. This is considering that the point of such calculations is to do what they can to make everyone across the league look like their talent alone has lead to their production. That is never the case in sports, let alone hockey. But, Minnesota has now shown that they are a serious team to reckon with come April. Other teams might find a way to break Dubnyk and their offensive will have to come to play. But for now, the central division is struggling to find anyone catching up to the Wild’s production and that could be enough for them to make the Western Conference finals, at least.